1.Homemade corned beef and cabbage– For a traditional take on St. Patrick’s Day festivities prep and enjoy a classic Irish dinner for your family and friends to enjoy. 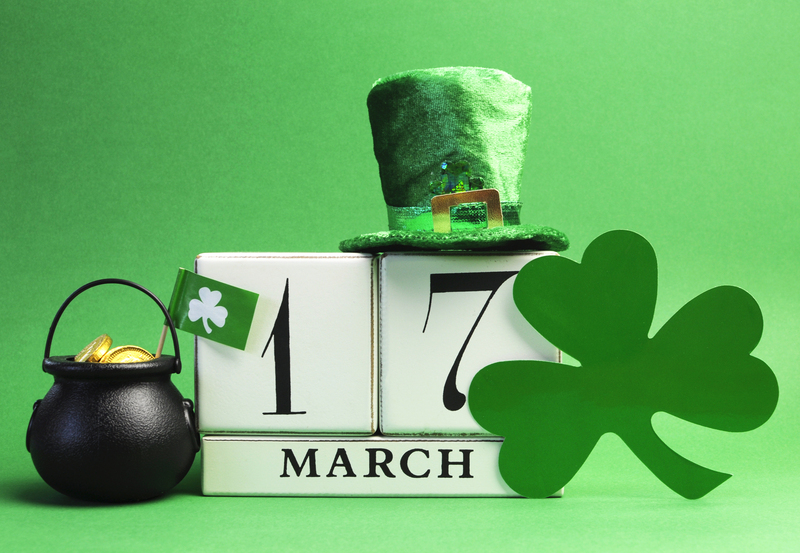 2.Wear shamrocks and/or green– tradition holds that if you avoid wearing green or shamrock clothing or accessories on March 17th, you’ll get pinched, so don’t forget to rock your green and show your Irish spirit. 3.Watch or participate in a St Patrick’s Day parade– You don’t have to live in Ireland or a big city to commemorate the day. If you are dealing with the cold weather, bundle up tight and see what your city or surrounding cities have to offer. 4.Make a green dessert- sweeten up the holiday with some favorite St. Paddy’s desserts. Shamrock cookies/cupcakes, chocolate & mint cheesecake bars and Irish soda bread cookies are some traditional favorites. 5.Enjoy a green beverage with family, friends, & co-workers- restaurants and street festivals throughout the United States will be serving tasty green drinks to commemorate the day. Have a drink and your green smile can compliment your St Paddy’s attire.